Yesterday concluded our first AIARE 2 Avalanche Course of the season. Despite less than optimal field conditions the course was super productive in large part to the considerable amount of experience brought to the classroom discussions by the varied participants. We were fortunate to have 8000m veteran expeditionary leader Phil Crampton, owner and operator of Altitude Junkies, in attendance. Phil’s resume of high altitude peaks is amazing and his personal experiences with massive Himalayan avalanches and vibrant story telling ability led to more than one topic derailment. These vivid first hand accounts were more than welcome however for both their educational real-life value and entertainment. We also had Jerry Isaak, Chair Associate Professor of Expeditionary Studies at the University of Plattsburgh. He has worked as an expedition leader and guide in Canada, the USA, Morocco, Scotland, Austria and the Arctic. Personal climbing and skiing expeditions include journeys in Kenya, Nepal and throughout North America. He was here to observe the course as part of the requirements of becoming an AIARE Course Leader, but he did much more than observe. Throughout both classroom and field session Jerry took advantage of opportunities to share his extensive knowledge and experience and all of his contributions were greatly valued. A graduate of Jerry’s program, a local professional sailboat racer turned back-country skier/mountaineer, and an EMS Climbing Guide/Electrician/EMT rounded out our class by staying fully engaged and generating thoughtful questions throughout. Our high point to the left of the mouth of Right Gully. From here we traversed into The Sluice for some decent turns. There is a lot of information to cover in an AIARE 2 Course. Anyone that thinks an AIARE 1 is information overload will be amazed when they attend an AIARE 2. We managed it fairly well and for the most part stayed out of the weeds. Feedback at the end of the day yesterday seemed consistent that everyone had acquired the skills needed to become an quality avalanche, snow, and weather observer. All that was needed now was practice. 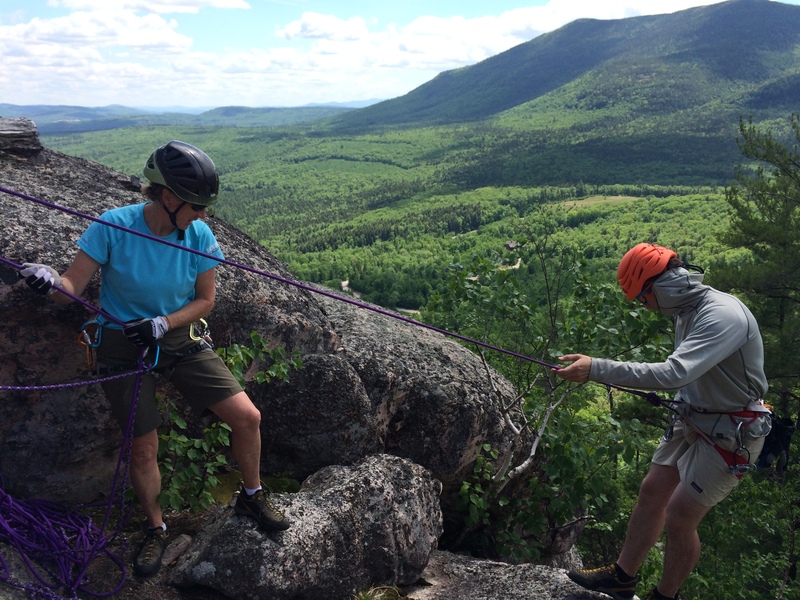 Quick Belay Transitions to Lowers; In order to give our guests more value in their climbing days it is often beneficial to lower a climber after they have topped out rather than convert everyone to a rappel. 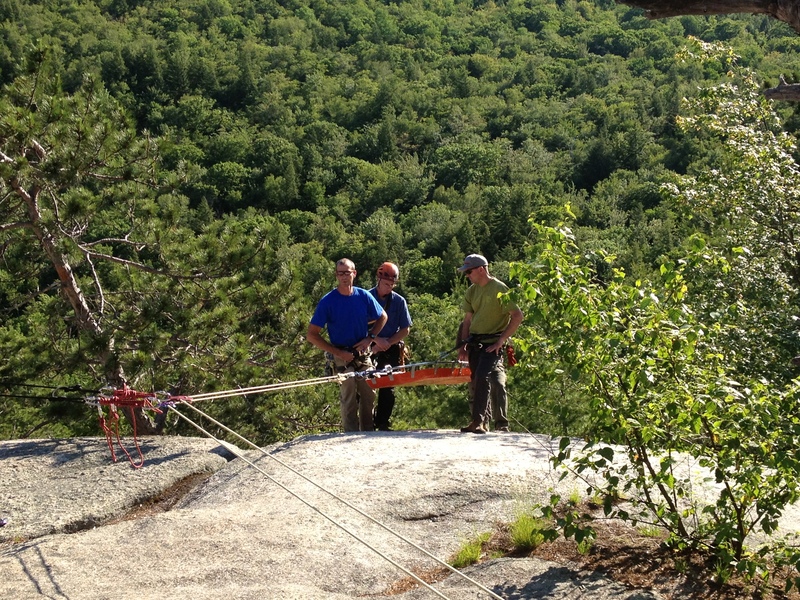 With some handy pre-rigging skills a guide can quickly lower a guest back to the deck and be rappelling seconds after the guest is back on the ground ready to move on to the next climb. I especially liked learning a better way of “tricking” my ATC Guide into a re-directed lower that did not involve opening the rope or anchor carabiners. 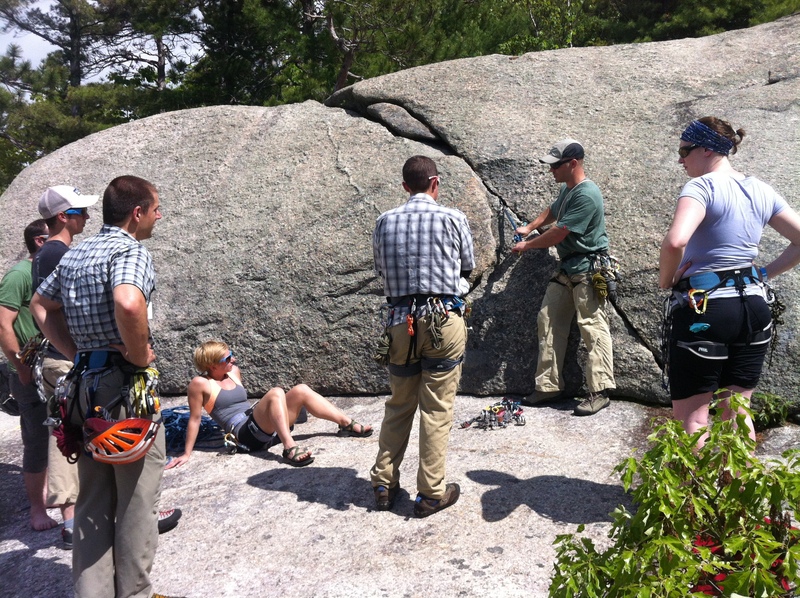 45 Minute Rescue Drill; This exercise in problem solving and conceptualization requires a solid understanding of belay escapes, tension release-able systems, 3:1, 5:1, 6:1 hauling systems, counter balance rappels, and improvised work-arounds. Being able to work through this scenario in 45 minutes (which seems like a lot of time… it isn’t) is a good test of how well one understands these concepts and can use them to fix any number of problems one can run into in the vertical world. 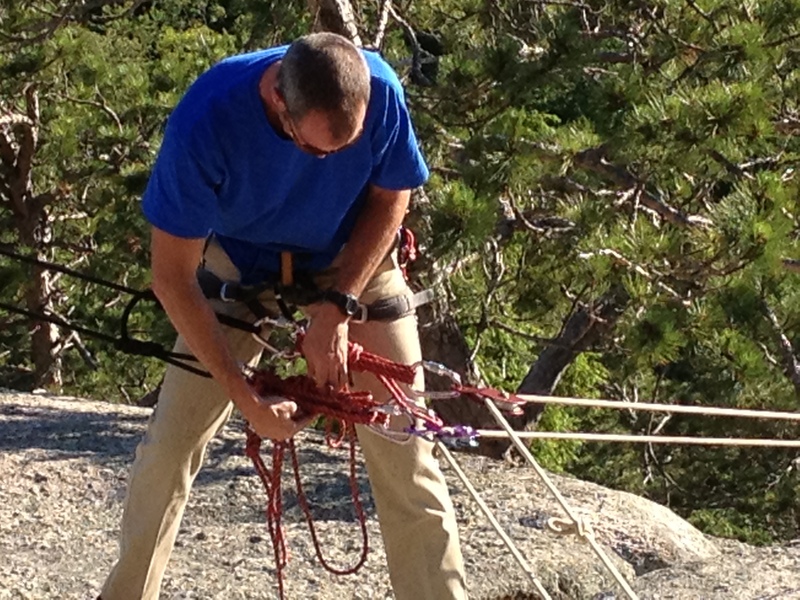 Quick Transitions from 5th Class Belaying to 4th Class Scrambling; Most multi-pitch guiding occurs in a 2:1 or 3:1 ratio, and being able to put a rope (or two) away and still provide top-belayed security for guests while scrambling up the last 400 feet of easy 5th class terrain can save an hour or more in a guiding day, allowing for more climbing for everyone involved. While practicing this I also got to climb a Whitehorse Slab route I have never finished, the aptly named “Beginner’s Route”, so it was nice to do something different. Short-roping transitions; There are some circuits on the backside of Whitehorse that provide some excellent 3rd & 4th class terrain to practice this skill. 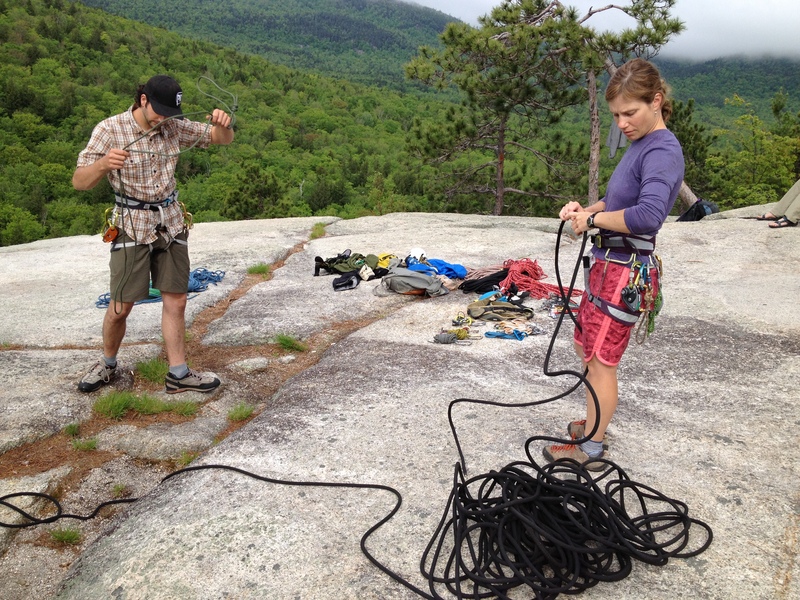 Short-roping, to short lowers, to belayed down climbing, and back up again. While these skills are a must for aspiring Alpine Guides they come in handy in quite a few spots around here, and with practice a party can move as fast as an un-roped party but with markedly better protection. This 2:1 training event was a bit new considering we usually schedule some larger group training events but the benefits were clear. If Anne or I had a question or wanted to practice a skill over again there was no hesitation to “go over it again”, something group training exercises might impede. 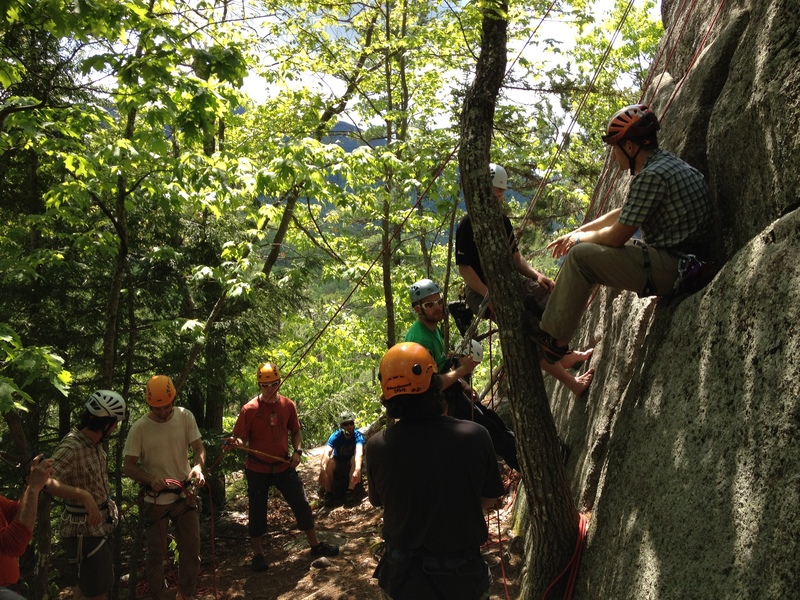 If these kind of skills interest you a great first step is to take an AMGA Single Pitch Instructor Course or AMGA Rock Instructor Course. I hope this brief recap sheds a little light on that question “What type of training do guides do to become guides?” After 10 years of guiding for EMS Schools it really is clear the learning never stops! 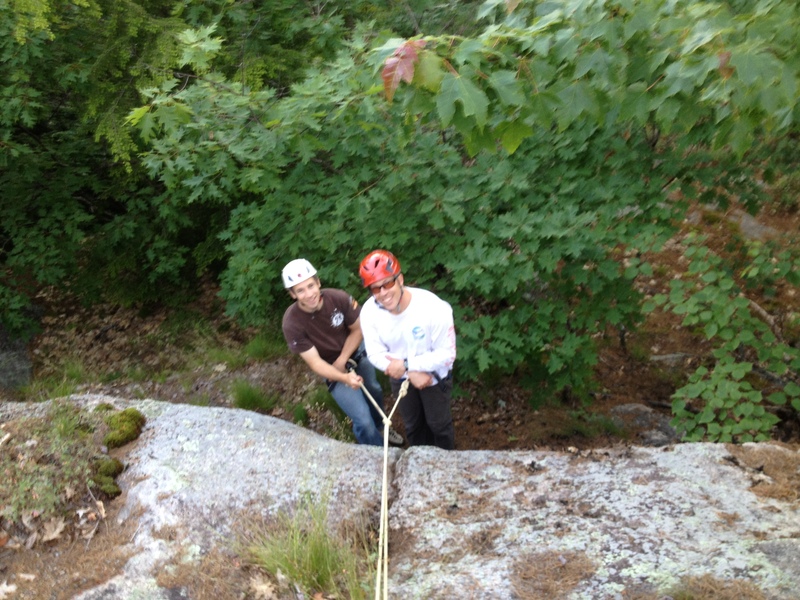 If you don’t work for EMS you probably don’t know what the Climbing Convergence is. 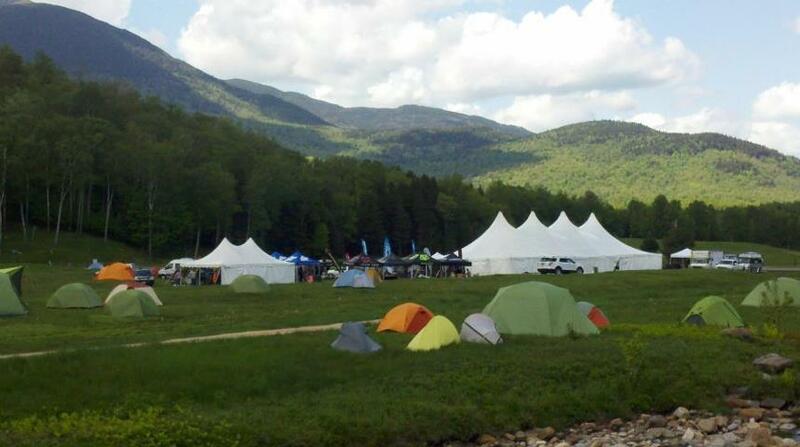 Technically, it’s staff training, but “staff training” does not begin to describe 160 employees from 60+ stores getting together in the heart of the White Mountains for 2 full days of climbing, clinics, training, hiking, cook-outs, camping, bonfires, slacking, and stuffing pockets with swag while perusing a vendor village. My part in the event was limited to one day at Cathedral Ledge, but it was enough to sense the kind of camaraderie folks who work for EMS share. 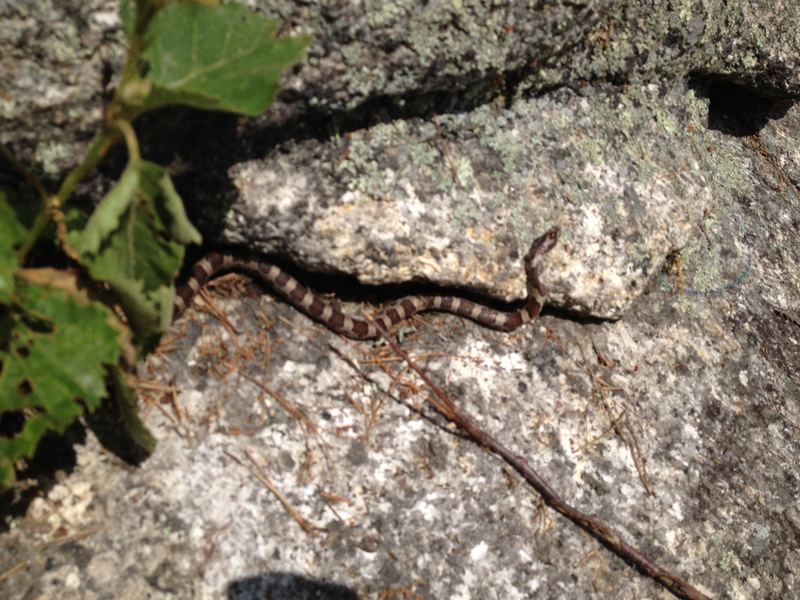 Anyone know what kind of snake this is? It is very cool to work with a company that takes authentic training like this so seriously. Sometimes I don’t think my own family understands. We LOVE what we do. It’s not just “retail”. It’s sharing a lifestyle, a healthy lifestyle, with our customers. 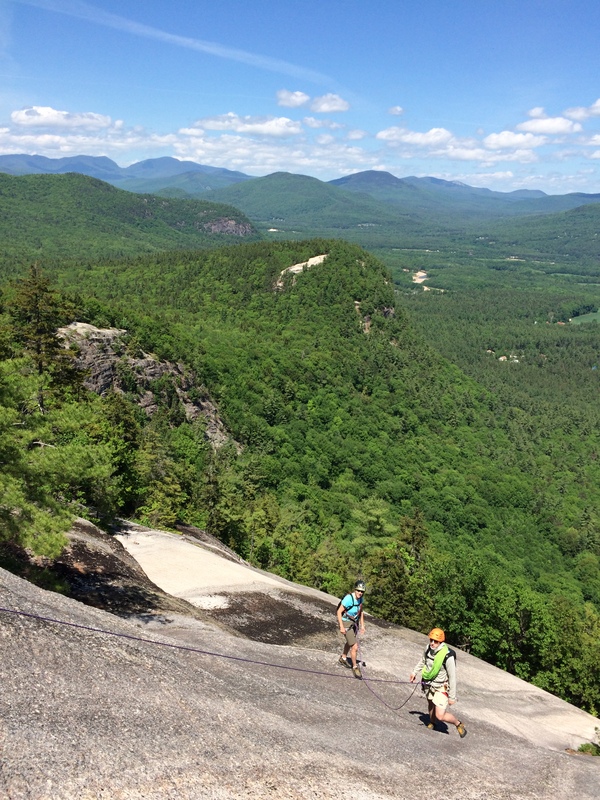 Climbing, hiking, kayaking, biking, ice climbing, backcountry skiing… these are the sports we represent, and these are our own personal passions. And our company puts events like this together to help us outfit our customers so they can enjoy these pursuits as much as we do… It just doesn’t get any better! 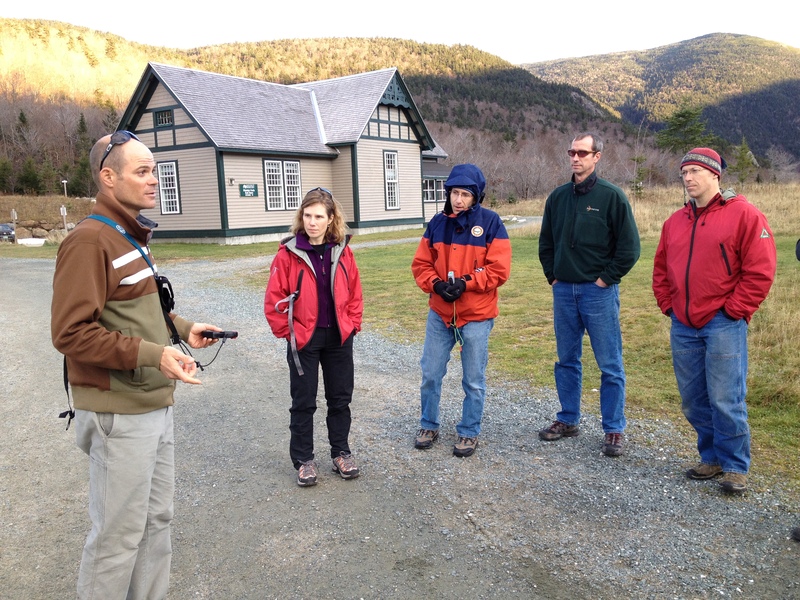 Yesterday I observed and assisted with a Level 1 Instructor Refresher course at the AMC Highland Center. AIARE requires current instructors partake in an IRC every three years to stay current with changes to the curriculum of AIARE courses and to improve their teaching skills through a facilitated open group discussion on a variety of topics. 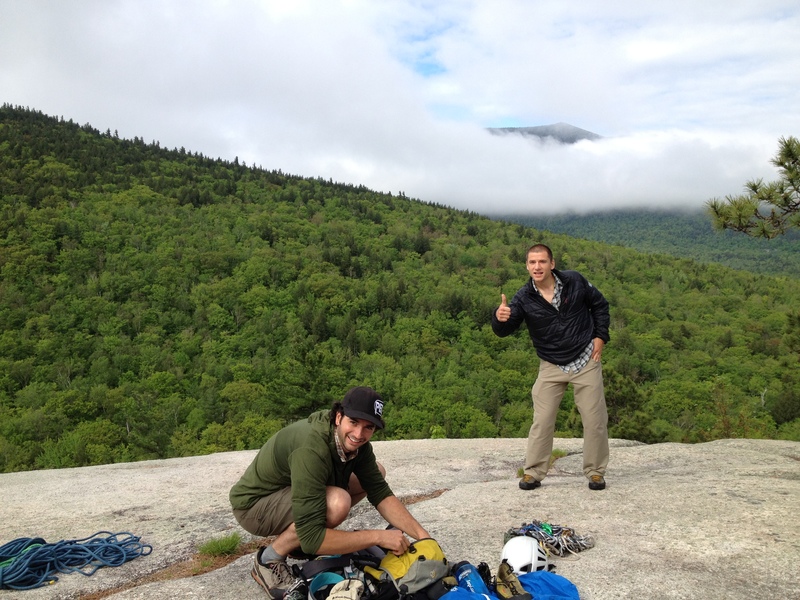 Tim Brown, an IFMGA guide and contributor to some of the recent changes in the curriculum facilitated the day. This particular IRC was open to anyone interested in AIARE’s curriculum and mission. With 9 people in attendance we covered a lot of the new updates to the student manual, presentation ideas, new tools empower students with, and ideas about how to take ownership of your course in a professional way. This was a good warmup for me before I head to Silverton, CO in less than a month to observe a full Level 1 Instructor Training course along with a Level 2 IRC. For more information about AIARE please visit http://www.avtraining.org. 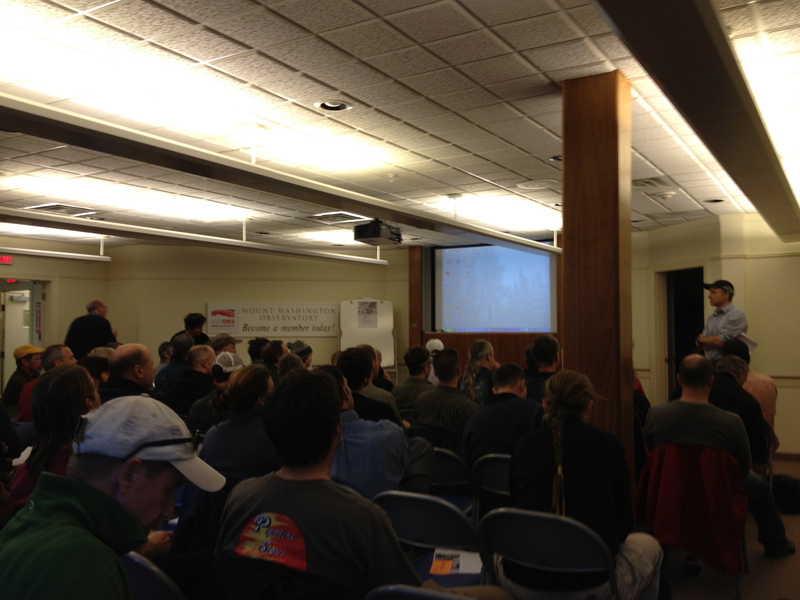 This past Saturday 80+ people attended the first annual Eastern Snow and Avalanche Workshop (ESAW). 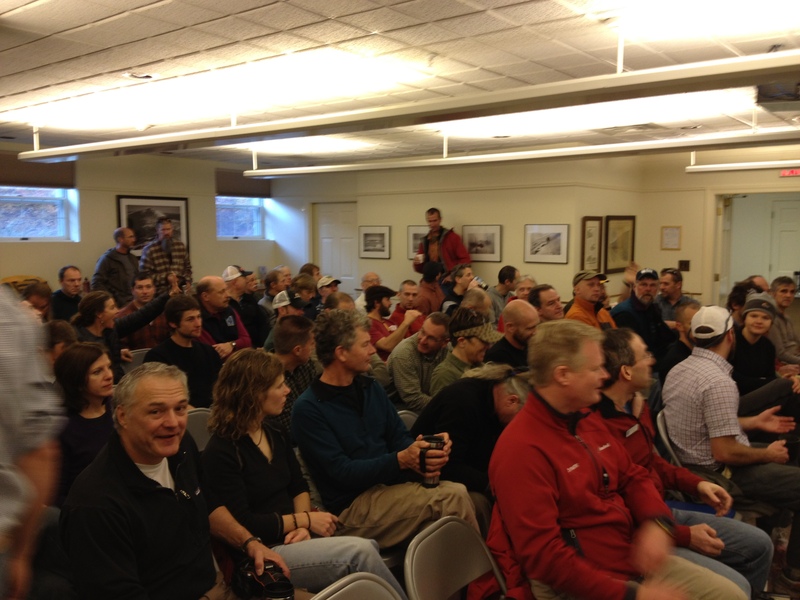 Members from organizations involved in avalanche education, snow science, and search and rescue from all over the greater New England area were in attendance. Chris Joosen, Lead Snow Ranger for USFS on Mt. Washington gave a talk on Spatial Variability in the White Mountains. Later in the afternoon he discussed avalanche accidents on Mount Washington, the eastern dilemma, and the role of social media and innovation, past, present and future. Jim Giglinto, a New York State Forest Ranger gave a presentation on Avalanches in the Adirondacks. Of particular interest to the group were the pictures presented depicting how existing slide paths have grown, some by more than 50%, in the wake of Hurricane Irene. Looks like there might be some potential first descents available this season! Kyle Tyler, the Eastern Representative of the American Avalanche Association gave a high speed informative talk on Propagation propensity of persistent weak layers. Rebecca Scholand from the Mount Washington Observatory gave an graphically beautiful and informative talk on Upslope Snow and it’s development and effects upon the White Mountains of NH. I’ll be begging her for some of her slides to use in future avalanche courses. After breaking for lunch Sam Colbeck, the former Senior Research Scientist at the Army’s Cold Region Research and Engineering Laboratory, gave a fascinating talk on Snow Physics, most notably how recent advances in technology have allowed us to get a better understanding of snow in relation to avalanches. His slides depicting different stages of metamorphism were very impressive. Eric Siefer, the Northeast rep for Mammut gave a presentation on the technology of air bags and their effect on avalanche safety. The cumulation of which was the demonstration of the technology by one young audience member. The last talk was given by Jonathan Shefftz, a member of the National Ski Patrol and passionate avalanche educator, who spoke about the benefits of giving Level 1 Avalanche Students pre-course homework. You can imagine that generated some entertaining discussion. 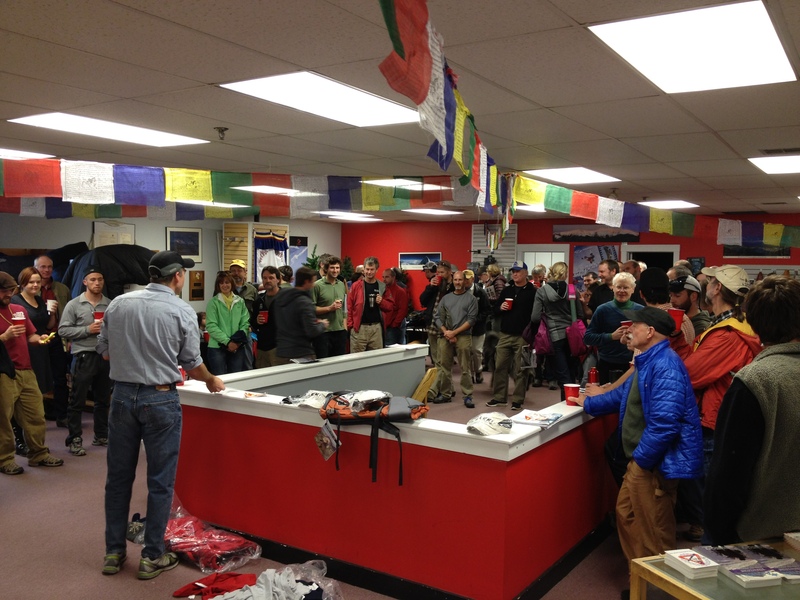 To wrap up the event most people retired to a social hour upstairs the nearby International Mountain Equipment store where there were vendor booths, raffles, and some graciously donated beer from Smuttynose. Many folks headed over to Flatbread Co. to continue the snow talk over dinner. All in all it was a great 1st event and something the east coast community will undoubtedly benefit from. 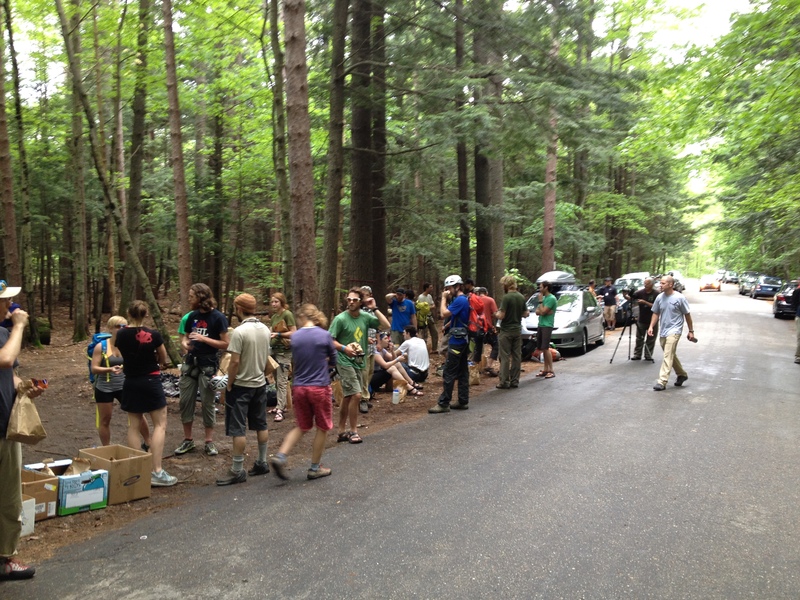 The proceeds from the event are going to the White Mountain Avalanche Education Fund. The fund is set up primarily to educate kids about avalanches across the Northeast. For more information on this fund check out: http://www.mountwashingtonavalanchecenter.org/about/white-mountain-avalanche-education-fund. Special thanks to Chris Joosen and Kyle Tyler for putting it all together!